USB 3.0/3.1 Gen 1 standard is ubiquitous across the world and has raised the demand to implement it in various products. The integration of USB 3.0/3.1 Gen 1 Device with FPGA development board needs 60+ I/O for USB 3.0/3.1 Gen 1 PHY chip to connect it with FPGA. This adds an extra cost to the board. Altera has introduce the FPGA which has in built transceiver which run at 5Gbps speed (same as USB 3.1 Gen 1 (USB 3.0) Specification) with features like 8b/10b, SKIP control etc. required during implementing USB 3.0/3.1 Gen 1 Controller. SLS has integrate the USB 3.1 Gen 1 Device IP Core with the Altera Transceiver and USB 2.0 PHY chip, and developed the eUSB 3.1 Gen 1 Device Controller IP Core, offering low cost solution. 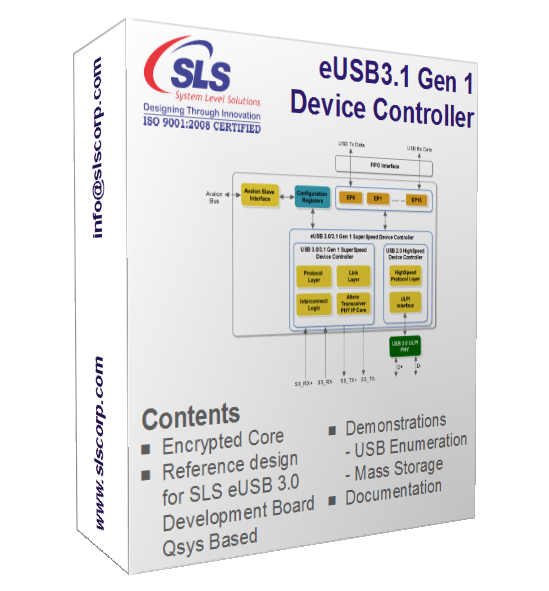 The eUSB 3.1 Gen 1 Device Controller IP Core is SuperSpeed Core developed by SLS to provide better solutions and options to user for implementation of USB 3.0/3.1 Gen 1 interface in their design. There is no need for external USB 3.1 Gen 1 PHY chip because IP Core supports SuperSpeed operation with Altera Transceiver running at 5Gbps in FPGA and High Speed operation with external USB 2.0 Transceiver PHY chip. This will reduces the I/O pin for USB 3.1 Gen 1 connection from 60+ to 18 and also saves board space. This provides a compatible link to both USB 3.1 Gen 1 and USB 2.0 Device for an embedded applications. The SLS eUSB 3.0 HSMC Snap On Board provides a platform for verification and testing of the IP Core.